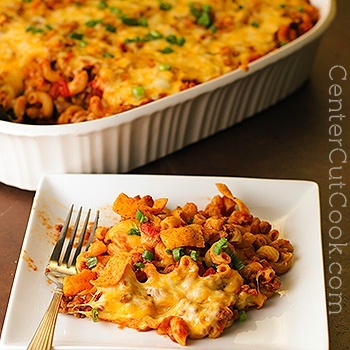 This Chili Cheese Casserole has elements of a hearty good chili, but is delivered to your table in the form of a pasta casserole that your whole family will enjoy! This recipe is for YOU, the person out there who loves chili (Have you tried my Slow Cooker Chili? ), loves pasta (this Italian Chicken Sausage Pasta is to die for! ), and can never turn down a good casserole! 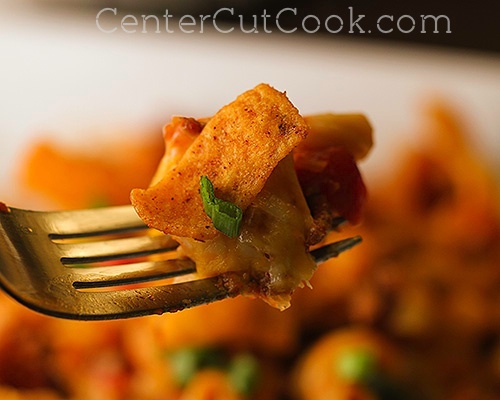 This Chili Cheese casserole has elements of a hearty good chili, but is delivered to your table in the form of a pasta casserole that your whole family will enjoy! I started off this Chili Cheese Casserole by cooking about a half pound of elbow macaroni. Make sure that you don’t use more than that, otherwise the pasta to sauce ratio will be off, and we don’t want that! Cook your pasta for about 1 minute less than the box recommends. This is because the pasta will continue cooking once it gets transferred into the casserole dish and baked in the oven a little later on. Once the ground beef is cooked, you’ll drain off the excess fat. Everybody has their own method for doing this, but here’s what I do. I line a bowl with paper towels and use a slotted spoon to remove the meat from the pan and transfer it to the bowl. Once all of the meat is in the bowl, I use paper towels to absorb any remaining fat in the pan. Then, I sort of pat the meat in the bowl with paper towels to remove any additional fat before retiring it to the pan. Do whatever works easiest for you! Next, you will sauté some onions in a little olive oil. I used 2 small yellow onions, but you could use 1 large onion. When the onions are just about done cooking, you will toss in garlic, chili powder, and cumin, and return the meat to the pan. Mmmm garlic and onions! A big ole’ can of crushed tomatoes, and one can of diced tomatoes will get tossed in, along with a little brown sugar to lightly sweeten the sauce and take away any bitterness. Simmer this meat and sauce mixture for about 10 minutes, then combine it with the previously cooked pasta. 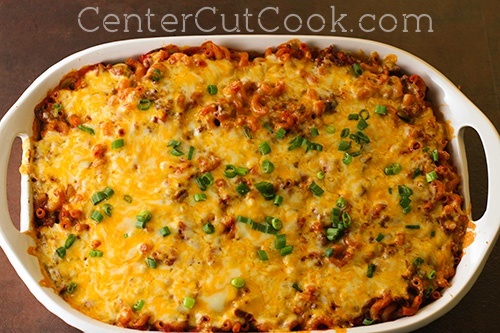 And since this casserole is named Chili CHEESE Casserole, you’ll toss in some cheese too. But not all of it, because you’ll want to reserve some to top the entire casserole with later on! Once you stir the meat, pasta, and sauce together really well, you’ll pour it into a 9 x 13 inch casserole dish and top it with cheese! I used co-jack, but feel free to use whatever you have on hand. A sharp cheddar would be a great option, and mozzarella would work too. Cover the casserole, and pop it into the oven for about 30 minutes, then remove the foil and cook for about 10 minutes longer until the cheese is melted and bubbly! 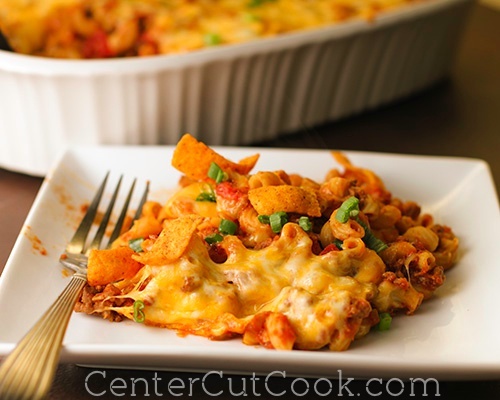 I served this casserole topped with chili cheese fritos to add a little crunch. This is totally optional, but so tasty! It’ll feed a crowd, so either plan to feed an army with it, or eat it as leftovers for lunch the next day! Leftovers are never a bad thing in this house. Enjoy! Cook pasta for one minute less than package directions. In a large non-stick skillet, cook 1 pound of lean ground beef. Break it into small pieces as it’s cooking. When it’s done, remove any excess fat from the pan. Set aside the meat for now. To the pan, add 3 tablespoons olive oil over medium heat. Sauté the onions until they’re almost done, then add in garlic and cook for a couple of minutes more. Stir in chili powder, cumin, and black pepper. Slowly stir in crushed tomatoes, diced tomatoes and brown sugar. Add the meat back in. Simmer the sauce for about 10 minutes. Combine the sauce and meat mixture with the cooked pasta. Stir in 1/2 cup of co-jack cheese. Pour the mixture into a 9 x 13 inch casserole dish. Top with remaining two cups of cheese. Cover with foil and bake for about 35 minutes. Remove the foil and cook for 10 minutes longer, or until the cheese is melted and bubbly. Top with green onion for garnish, and Fritos if you’d like.